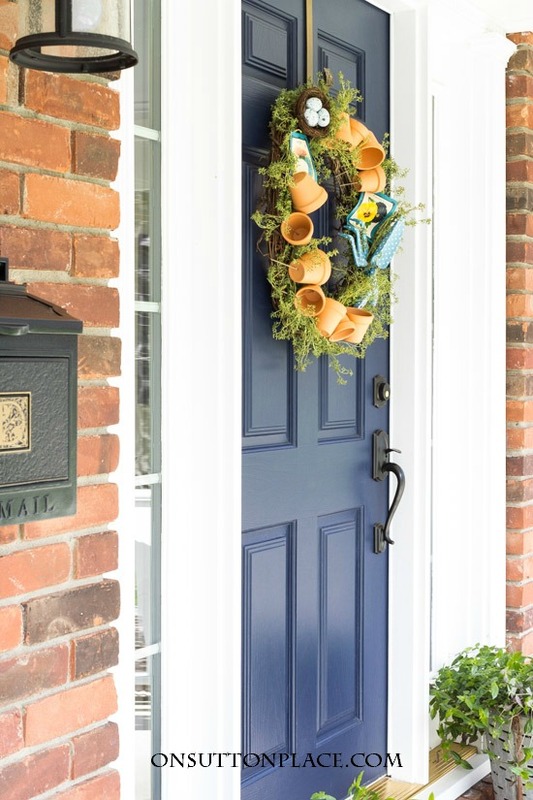 Answers to frequently asked questions from On Sutton Place readers including my front door paint color & porch decor sources! Do you have a question? Below are some of the most frequently asked questions I get from readers, especially people visiting for the first time. If you have a question not answered here, simply shoot me an email at ann@onsuttonplace.com and I will respond as soon as I can. 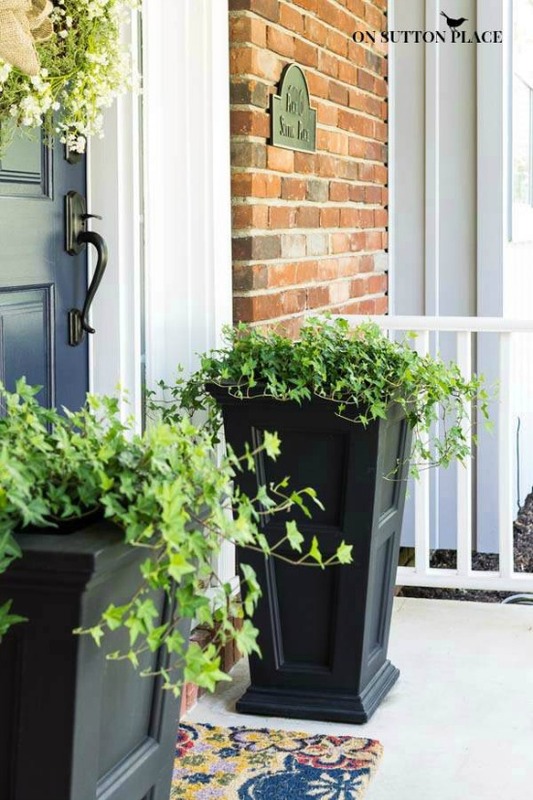 Where did you get your front porch black planters? There are actually several sets of planters that have been featured on my porch. First, there were these Mayne Nantucket Tall Planters that are pictured above. These are the ones that get asked about the most. My family gave me these planters for my birthday in 2011 which was the first year of my blog. At some point I moved them to our back deck and replaced them first with galvanized washtubs and then vintage olive buckets. Currently, I have Mayne Cape Cod Square Planters. 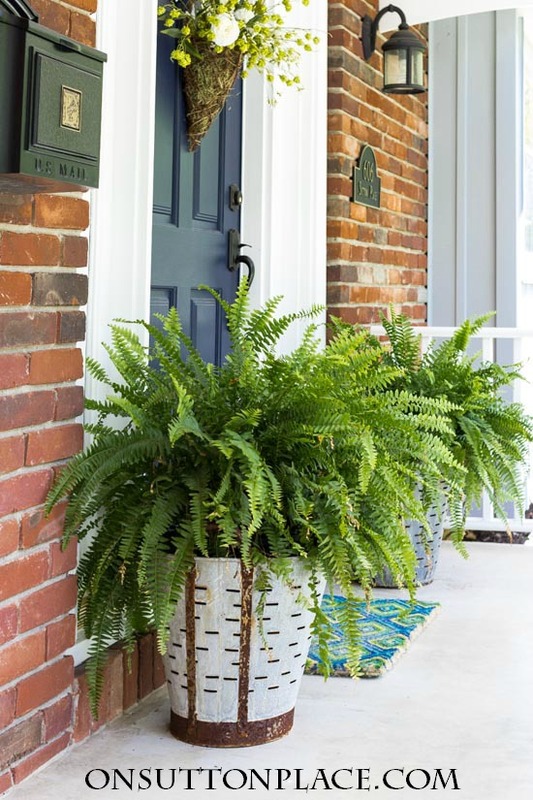 Last summer I filled them with ferns and loved the way they looked. I just may do that again this year! Where did you get your olive buckets? I got the set featured below on eBay. They are genuinely vintage and are about the same height, but they don’t exactly match. I think olive buckets are tricky. Some of the new ones look like they are vintage…in fact, it’s very hard to tell sometimes. A new, reproduction olive bucket is usually much less expensive than an authentic one. An authentic one can cost anywhere between $45 and $80. I have seen them on Etsy for even more than that. From my research and years of shopping online, I think a good price would be in the $50 range. If you happen to be attending a Country Living Fair, I know there are usually sellers who have stacks and stacks of olive buckets. Do your front porch pillows get wet? Yes, actually they do! Of course, it depends on the way the wind blows but they usually get a little damp when it rains. I decided a long time ago that I was not going to let that stop me from using pillows and throws on my porch. I try to use washable fabrics but there have been occasions when I have not. (Like this Christmas porch.) Even if the pillows get wet, they eventually dry out. I have never had anything get ruined from rain or snow. I have a covered porch that is open to the elements from the front…so my rockers do get some protection. That is definitely something to consider when making your decision. Have you ever considered painting your wood furniture? The short answer is “Yes, many times.” The long answer is that even though I would like to, my husband is dead-set against it. I agree with him when it comes to the dining room, but there are other pieces that are not as valuable that I would like to paint. We’ve been married 36 years and he has never had much of an opinion about the decor in our home. I can pretty much do what I want if it’s within budget. I figure since he feels so strongly about NOT painting our furniture, I should respect that and just let it go! Why don’t you ever show your kitchen? When it comes to frequently asked questions, this one is always hard for me to answer. As always, I will try to be as honest as possible…and there are actually two reasons. First, my kitchen is difficult to photograph. There is a huge window and I am limited by my camera lenses as to how much I can fit into a shot. The lens that I really need is more than $1,000.00 and there has never been a time when I felt I could justify that expense. Second, it’s outdated. The appliances are nice and of course the floor is new, but the rest of it needs an update. I have a plan in my head of what I would do. I know what counters I would choose, what cabinet style, and the exact sink. I’m not saying it will never happen, but it’s not happening anytime soon. So…I may show bits of my kitchen, like when I shared my kitchen herb garden basket, but that’s about it for now. p.s. I don’t want to come off as being ungrateful or spoiled…because I am neither. I’m just trying to be honest. I am comfortable in my kitchen and enjoy the time I spend there. It could definitely function better but I’ve maxed out what I can do without a renovation. So there won’t be anything new happening, therefore not much to show you! Where do you store your pillows and inserts? My pillow storage has changed over the years as my collection has grown. When I had a sewing room, that’s where I stored all my pillow covers and inserts. I had a shelf filled with bins of covers and stacked inserts. I recently dismantled most of my sewing room so the two pillow cover bins were moved to a linen closet in our family bath. I kept the inserts in the sewing room closet. It’s not perfect storage for sure but it works for now. 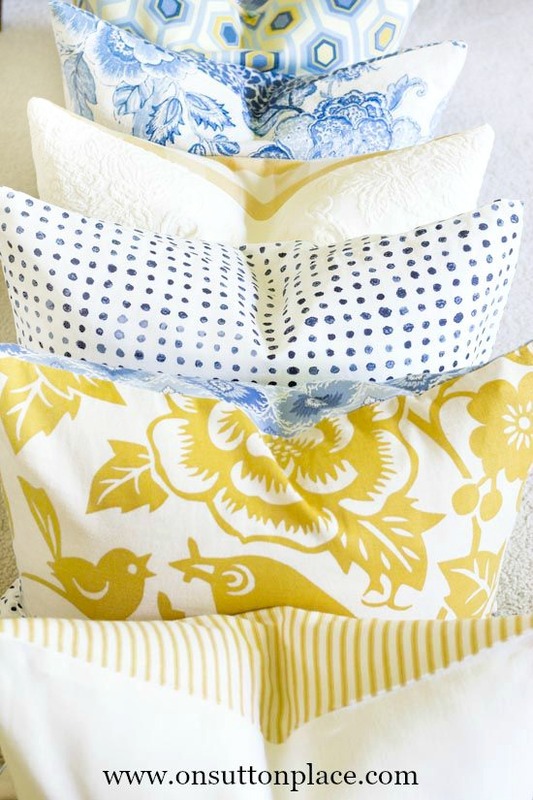 My friend, Kelley Nan, came up with an absolutely brilliant way to store pillow covers. Visit her post Gift Wrap Organization and Throw Pillow Storage Solutions to see what she did. It’s on my list of things to do! My #1 most asked question: What is your front door paint color? The color of my front door is Naval from Sherwin Williams. It is, in my opinion, the perfect navy blue. The door was red originally, so to cover that we used a coat of gray primer followed by two coats of Naval in a satin finish. We used the paint specifically made for outdoors. I really love how it looks up close and also from the street. I highly recommend it! 1. Thank you for the link to the post on pillow storage. 2. I agree with the decision to not paint your beautiful wood furniture. I love how you decorate allowing the beauty of those natural wood pieces to shine. 3. Your kitchen is lovely! I love your honesty. And, honestly, I think your kitchen is quite lovely. I want to update mine too, but I cannot financially justify it. I’m in the same boat. But, I love your style and candor. Ann your kitchen is so cute! Ann, I enjoyed reading the Q & A’s. I LOVE YOUR KITCHEN!!! It looks so homey & is always so neat & tidy. I think I’ve seen your big window once & I thought–how cool. My husband is the same way about painted furniture. I do have a few pieces I would paint if he didn’t object so much. Also, I love the parts of your kitchen that you’ve shown! I LOVE the part of your kitchen we’ve seen – it’s so neat and clean and organized! I remember the coffee bar you shared sometime ago and thought what I was seeing then was VERY pretty! So THANK YOU for sharing the area you have; GOOD THINGS come from that kitchen! Hi Ann – Thanks for sharing these FAQs. I love the color of your front door. You are right, it is the perfect color of Navy Blue. I’m like you, I try to use outdoor fabric for my pillows. It does help mine. I would love to update my kitchen but it’s not in the budget so I live with it. Lol. The pic of your kitchen is pretty. That little bit of your kitchen shown, looks very nice. I also have a husband who likes wood furniture to be wood, not painted. Everything else is whatever I like. He’s been a keeper for 48 years, so the furniture being wood and not painted bothers me not at all. I made your Lemon 7 Up Bundt cake for Easter. It was just delicious and so easy to make. I love your home. Your kitchen is beautiful just the way it is. I have stopped reading most blogs, but I still read yours because your home is classic and timeless. It gives me attainable ideas. The majority of us don’t have unlimited budgets. Your home looks like you are a good steward of what you have been given and I appreciate that you don’t tear out and throw away just for the sake of keeping up with other bloggers and trends. Keep being real. Thank you Alli…that is good advice and I promise to follow it. It would be way too hard to try and be someone I’m not…so there’s no sense in even thinking about it. I appreciate your comment! @ Alli — I agree with what you wrote! I also really appreciate your honesty, Ann! My kitchen is in desperate need updating and is #1 on the list. Sadly, we took a hit on taxes, so a remodel isn’t feasible until later in the year. But, all in due time! We added a sun porch to our house two summers ago and i struggled with the color of the two exterior doors. I was certain i wanted red until i saw your front door in naval. My doors were painted naval (with brushed nickle hardware) and get tons of compliments. Thank you so much for the inspiration! You are so welcome…and thank you for telling me. I love to hear when something works! I admire your choice to fill your home with what you love, rather than following the latest, trendiest styles, (even if those choices are largely budget driven!). I’ve always though the glimpses of your kitchen that you have showed, were lovely. I followed your journey with you mom with great interest, as we were on similar paths. My mother died in February, at 97. After caring for her for many years, my home has been quite neglected. As I look around, I see that my spaces are outdated, depressing, and much in need of a cohesive overhaul. I need to incorporate several inherited pieces, and come up with a plan for the entire house but am quite stuck as to where to begin. At the moment I am overwhelmed with clearing out Mom’s apartment, but I’d appreciate any advice you might have on where and how to start. I appreciate your honest sharing and admire the home you’ve created. My tatse is less formal and more cottagey, but my eyes always enjoy the serene and classic spaces you show us. I’ve learned a lot from you. Thanks!! Hi Fran…I’m so sorry about your mom. I totally know how you feel. As far as a plan for your home, my best advice is to take just a couple of rooms at a time. To look at the big picture is usually overwhelming. Perhaps start with the most used rooms. Decide what stays and what goes. Get rid of anything that you don’t like or that means nothing to you. Second step is to paint. Think light and bright. After that, put your things back and live with it for a while. The rest will come. Best of luck! HI Ann, I agree with the other ladies, your kitchen is lovely just the way it is. It’s warm, cozy and impeccably decorated. I love that you are real and relatable in that you can’t always do exactly what you want to do, when you want to do it. Love your blog and look forward to receiving your emails. I’ve gotten many good ideas from you, sometimes just some small thing but it makes a big difference. Keep up the good work…and don’t feel bad about showing us your kitchen! I would love an opinion on this subject. My family hates my family room, says it so uncomfortable. One reason, I have a very small tv in an armoire. My next step is to purchase a monster flat screen. I still would like to hide it, but can’t find a reasonably priced narrow media piece. Hide it or mount it on the wall. I do not have a fireplace to put above it, nor do I like that look. Hi Debra…I think that if you are getting a really big TV, there are two choices. 1.) hang it on the wall with some sort of credenza under it or 2.) set it on the credenza. I don’t think it’s necessary to hide it. I have seen “TV walls” where the homeowner has hung pictures around the TV and it looks wonderful. Here is a link from my friend Kris who did this: https://www.drivenbydecor.com/one-room-challenge-family-room-reveal/ My dad just purchased a big smart tv and did the same thing. We found a credenza with storage that the TV sits on. It looks great! I took a peek at the website you mentioned. It does look wonderful with the artwork grid. My only challenge is the tv is so much bigger. Thanks so much for your advice. I laughed when I read how your husband has never had much of an opinion about your home decor but doesn’t want to paint your wood furniture. I’ve been married almost 43 years and my husband has never said no to anything I wanted to do around the house. I came home one day after visiting a friend and said her interior doors were black and I loved them and wanted to paint ours. He said “no”, I was shocked, he’d never said that before, but felt since he’d never said that before it was important to him. We then went to two funerals where the man had passed away, both widows were going to change things in their house their husbands didn’t want to do. On the way home from the second funeral I asked my husband what he would change in our home if I died, he said nothing, he asked me, I said I’d paint the doors black. I got a gallon of black paint for my birthday . . . he loves our black doors. Ann, I love the story about the black doors from one of your readers. It made me chuckle. After having lost my husband recently after 45 years of marriage I know how it feels to decide whether to change things they didn’t want to be changed. My husband gave me full reign to decorate which I really appreciated, although there were a few things he said “no” to. He liked the natural wood or lightly stained. I would never paint any of my woodwork because of that, but I am going to paint my kitchen cabinets. I think he would understand. Now on to your answers . . . this is truly my opinion so take it with a grain of salt. I would not paint your dining room furniture either. It’s beautiful! I have a china cabinet that was painted the ugliest green but was solid wood. Normally I would not paint most furniture, but this was ugly. Did I tell you how ugly it was? I painted it a creamy white and the back of the shelves I painted brown. I love it! Hubby didn’t say “no” to that because I think he thought it was ugly too. What you have shown in your kitchen is lovely. I don’t think there is anything wrong with it and if you are happy with it that’s all that matters. My kitchen, on the other hand, needs a complete makeover. Walls need to be painted, new floor and like I said, the cabinets will be painted. I have a large solid oak stained very dark TV cabinet that my husband did not want to get rid of. The TV in it doesn’t work anymore either. I didn’t know what to do with it and I suspect the reason my husband was hanging on to it was that it was solid oak. I finally came up with an idea to turn it into a kitchen island. Like I said it’s rather large. I feel I’m honoring his wishes in a way and giving it a new life. The link for your friend about storing pillow forms I will definitely take a look at. Sorry for the long response. I always look forward to your posts and this is no exception! Love your post and your kitchen, it looks like it fits your home,please show more of it.We always appreciate your updating and decorating ideas. Thank you! That was a fun and enlightening post. And I love that cute little corner of your kitchen! Great post, I love that you are honest. The question and answer about your kitchen and dining room honest. My husband also requested that I not paint my dining room table. Please indicate the best sites to purchase pillow covers. The covers and throws you have collected are lovely. Hi Christy! The pillow covers in the picture above were all made by me. I used to make all my pillow covers but in the last few years I have actually started purchasing them ready-made. One of my favorite places to buy pillows is TJMaxx. Homegoods would be about the same thing. Many times you can find lovely, large pillows with down inserts for around $20 which is a bargain. I also shop on Etsy. I linked to my favorite Etsy shops in this post: https://www.onsuttonplace.com/5-tips-for-mixing-fabric-patterns/ The quilts are all vintage and purchased on eBay or at my antique mall. I usually get my throws on Amazon! (Which by the way is another great place to get pillow covers at a reasonable price.) Maybe I’ll write a post on all of this! Speaking of pillows…I stuffed my outdoor pillows tight with empty plastic grocery bags. If they get wet, they dry quickly and if worried about the wind blowing them away, there are several ways to eliminate that problem. I have added a safety pin with string to the back side and tied to chair, or enclosed a paver inside pillow, a filled vegetable can and etc., this has worked great for me! I love OSP!! I love your whole house including your kitchen. You have great taste. I agree with your readers about your kitchen! It is so lovely just as it is. I, too, would like to redo mine but it is not going to happen unless I win the lottery! Oh this made me laugh out loud…because I am in the same boat! I love the color of your front door, and plan to paint mine the same color. I also have shutters on either side of my windows. Are your shutters painted the same color as your door, or are they black? I can’t tell by your photos. Love your blog!! Thanks Ann! The shutters are painted a very dark gray. 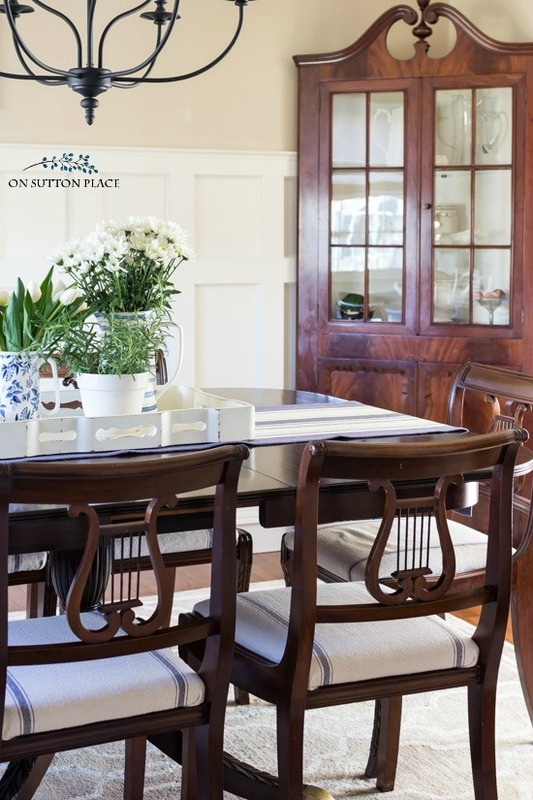 You can get more information here: https://www.onsuttonplace.com/on-sutton-place-paint-colors/ Thank you! I was pretty sure that I knew what your #1 question would be. I have saved that information so that if I can ever convince my husband to paint our front door, I can use that color. I just love it. By the way, my husband is a woodworker as a hobby and he is 100% dead set against painting wood furniture. I have a couple of older pieces that I brought into the marriage so I may go ahead and paint those. I like painted furniture but to him it is sacrilege to paint over wood. LOL. Since your husband doesn’t much care what else you do, you are lucky. Your kitchen would suit me well. Looks loved with lots of memories. I see your loved blue! 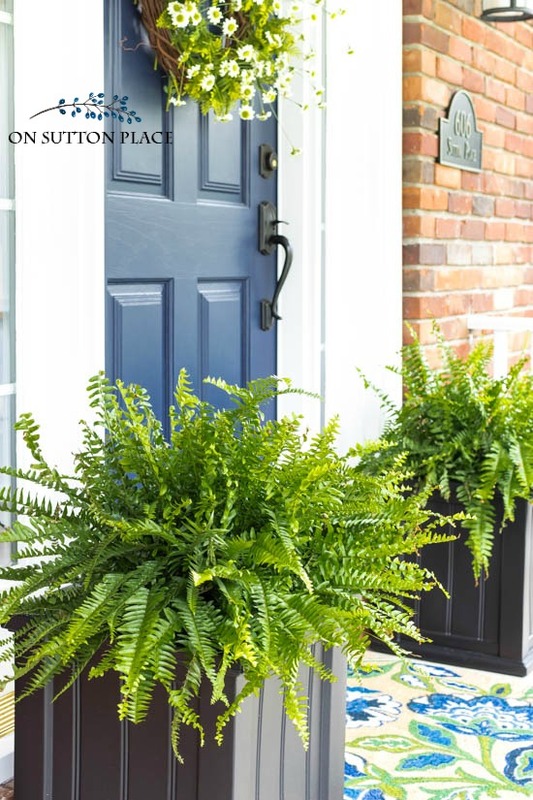 New question: what direction does your front porch face that you can have the ferns there? Hi Nan! The front porch faces east so it gets morning sun. It’s also covered so that helps keep the ferns from frying! Ann, I began to follow you because your decorating style is beautiful and attainable! Thank you for not always following the latest trends and keeping your home traditional and classy! Those of us who live in the real world of budgets and husbands appreciate your honesty! I think you should feature your kitchen more. I like the fact that it isn’t new or crazy huge. It is updated and so cozy. A lot of people can relate to working with what you have. So many blogs and pinterest and instagram etc focus on the perfect and huge and expensive spaces. While it is pretty to look at, it is often discouraging. I find myself drawn more and more to the smaller homes with realistic cozy spaces. They give me more inspiration. The beautiful kitchens are actually the reason I don’t use Instagram very much. I post there maybe once or twice a week but every time I visit, I get discouraged too. I will keep your comment in mind whenever I am feeling like I don’t measure up. Thank you so much! Just a suggestion about your kitchen that I think other readers would agree with me. Many of us have kitchens that are not updated, but we still need your ideas about how to decorate. I love seeing how you change things around just to give a new look. I think your kitchen is lovely. Your kitchen is really a unique style, and I personally like it much more than all the new trends in kitchens. Rooms don’t always need the latest on things-just prettied up. Show more of your kitchen please!! Ann, the most encouraging thing I’ve ever seen on your blog was one about the kitchen! I had had estimates on a new kitchen, and it just wasn’t gonna happen financially. When I saw that you also had tile cabinet tops, I sent a question–can’t even remember what the question was, but the answer was so uplifting that I decided I could abide mine for a bit longer! Now, I am the owner of a brand new kitchen and I love it! I see you more as a reality-based encouraging individual who just happens to have an amazing house. Oh congratulation on your new kitchen…I am totally excited for you! Thanks for your sweet comment…I so appreciate it. Loved the site for organization!! Now, the time and desire to actually complete the must needed task at hand!! Your kitchen is so beautiful. Two years ago I completely remodeled my back door entrance and kitchen. The style is so similar to your existing kitchen!!! Except I have quartz counters now. Love the tile accents you have, so authentic. If I had what you currently have, I would not have gone through the effort, believe me!!! Interestingly, I have the same vintage scale, in cream and blue!!!! I’m an Ann wanna-be!!! As always, love your site and wait patiently for your next article. Thank you Carol…quartz counters are what I would love to have so I applaud your choice! May I ask what brand you decided on? Ann, I have always loved the parts of the kitchen that you show and am particularly enthralled with your tile countertops. 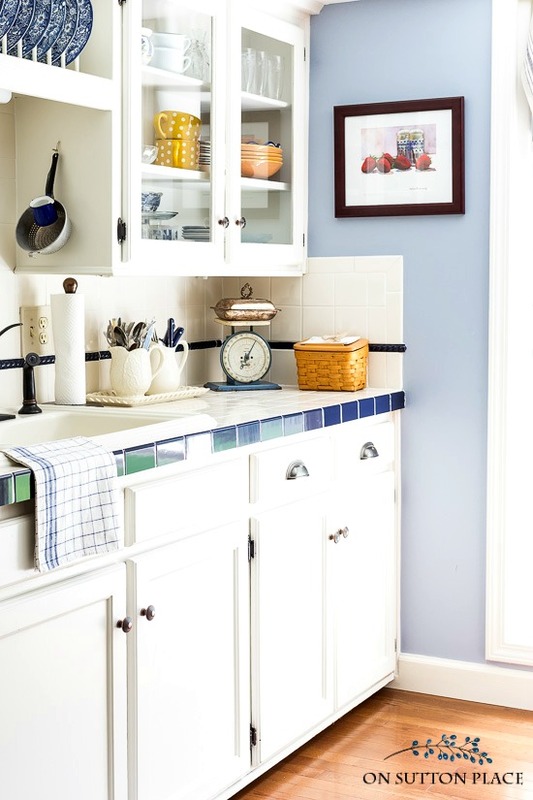 I had tile countertops in a previous home and loved them (mine were cobalt blue which along with yellow is one of my favorite colors). I have even considered having tile countertops installed here at the farmhouse, if only around the stove area. Thank you! I liked my tile counters for many years, but they are showing wear and tear…and are difficult to keep clean. I definitely think they are a great choice for a stove surround or backsplash too. I’ve read your blog for years. A few major changes and it took awhile to say goodbye to your gold/yellow decor. But the floor and the wainscoting is beautiful and of course your flair:). I think your kitchen is pretty, homey, and real! 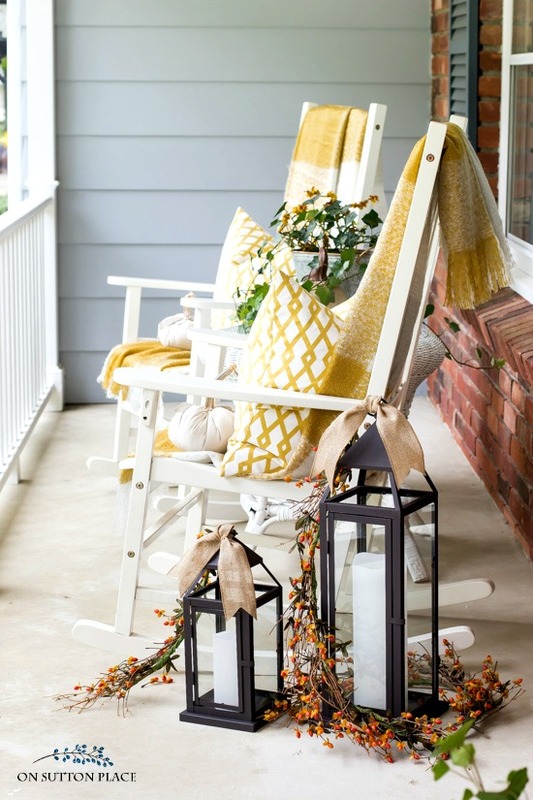 Some readers do not have update kitchens and you’ve given me ideas, so thank you for that and I just thought of your back porch, so inviting too:). Thank you Kathleen…you have been such a good friend. My back porch is currently empty! I cleared it out last summer and gave the wicker to a young friend of mine. I could not keep up with the chipping and painting. I hope to get a few new things soon but I’m not sure about that. I’ll keep you updated!